That's what I think about felting. I think it is magic. 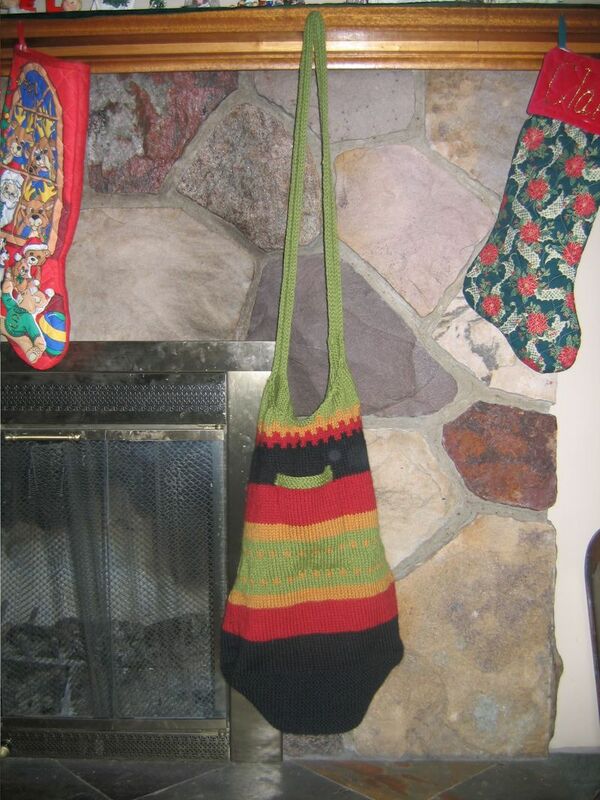 First you have the magic of sticks and string, the pleasure of easy, quick, somewhat mindless knitting around and around until you have a bag that you could carry a good sized child in. Then you drop it in the washing machine with some jeans you needed to wash anyway, bash it around for a little while, and presto! What was an enormous and shapeless bag is now a very chic purse. Wanna see what I did? I'm very pleased with it. The pattern is the "Elizabeth Bag" from Black Sheep Bags. 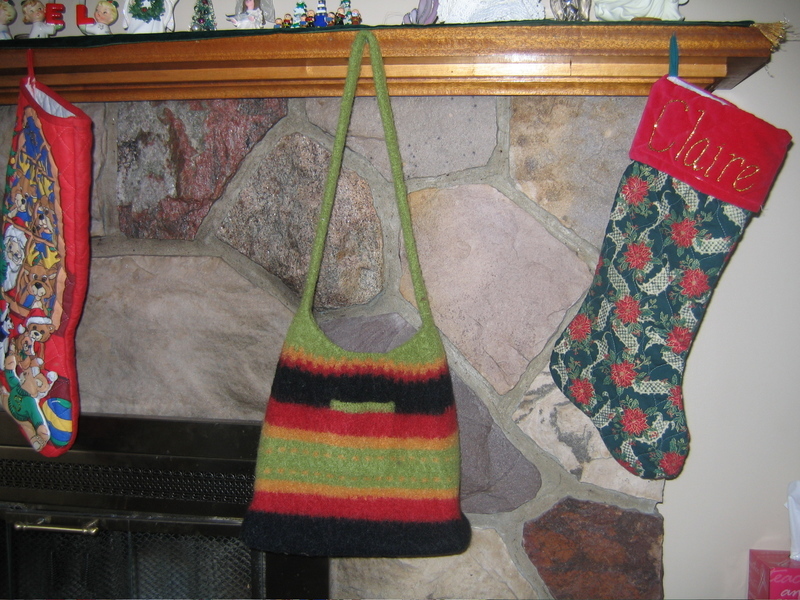 I used Patons Classic Wool in Black, Old Gold, Rich Red, and Leaf Green. This yarn is very nice (100% Merino) and usually runs less than $9 per 100g ball. It does sort of feel rough in the ball but the drape is lovely and I'm sure it would soften nicely in a gently bath. I'd make a sweater out of this anytime. This is the second time I've made this bag and I made a teeny modification to the pattern. With about 20 rows to go before top shaping I decided I wanted pockets. I guessed that 20 stitches might be close to the right width, did some quick math, knit from the corner marker, K20 with waste yarn, slipped those stitches back onto the left needle, then knit over them with the black yarn. I did the same on both long sides. When the bag and strap were done I came back and picked up the 20 stitches on above and below the waste yarn. I knit 6 rows of garter stitch (in leaf green) and cast off on the lower edge to form a placket. I knit a pocket flap down from the top edge about 6" long. Then I carefully stitched the placket down in front and the pocket flap to the inside of the bag. Then I worried about what to do if the pocket felted closed. 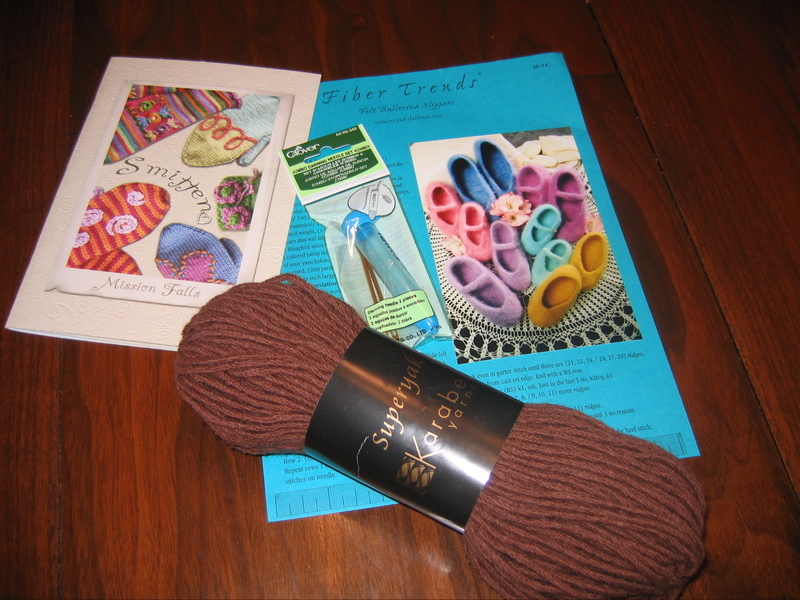 I decided just to watch it and to stick my fingers into the hot wool pocket every once in a while to keep the fibers separate. What we won't do for the craft! Wonder of wonders - the pockets didn't even try to felt closed! First trip through the machine was 10 minutes, 2nd trip was 6 minutes. Stitch definition was gone in the first trip but I wanted it a little bit smaller. If you look carefully at the wide green band you can see some 4 stitch gold dots in it. I just carried the other yarn across the back when I did those. Even the carried strands are completely felted into the cloth. The pocket looks like a part of the inside not a separate piece. Best of all, it fits my cell phone perfectly! I still have a plan to do a Celtic motif around this bag. I'd like something wide, like a Saxon Braid, that I could work in a single band right around the middle of the bag. Trouble is I haven't any idea how to chart that despite MANY hours online trying to divine how or to avoid having to do it myself. If anyone knows of a colourwork chart for a celtic border pattern that repeats continuously please please please let me know! I'll give you the first bag! I read a beautiful post today. Mamacate has written so eloquently about this season of the year. Every year I look at the lights on houses and the trees in living room windows. I light candles, I gaze upwards at a blue sky, and I crave the light. I stand in sunbeams, letting the light push into my face, absorbing it through every pore and feeling the warmth of life it brings. Today, I turned off the lights in my classroom and watched the sunrise with my students. We sat quietly enjoying the touch of light on the clouds, watching the play of colour as it moved from a bare red glimmer, to orange and fuscia painted across the sky, then to gold and silver and pure new light. Every year the Solstice makes me pause and think of the role of light in my life. The light of love given and returned, the light of spirit filling me and mine, the light of generousity and understanding and kindness. These are the prayers of my heart as I light my Solstice candle. I will sit quietly in gratitude for the blessings of the light in my life and reach out for the strength to share that light with others. Blessed Solstice. Maybe it is a disorder? The "Smittens" leaflet from Mission Falls. I like the ideas in this pattern book. I've never actually knitted mittens but I think I will. These are all done in the flat! What a bonus for my Chicks who are having trouble getting the hang of double points in the round. A chibi! Readers will recall that I have been trying to get one of these for the longest time. Honestly, even I don't know what the fuss is all about. I just needed it ok! Mine is quite a pretty baby blue, and is see through. I've been looking at this felted ballerina slipper pattern for a while. My daughter may just get a pair for Christmas. And evidence that I may indeed have a disorder. One skein of "Superyak" from Karabella yarns in the colour "copper". This is 50% Yak and 50% Merino. Yes. I said "Yak"
It's more mid-brown than copper. I usually think of that colour as warmer, maybe even orangy. It is quite soft and loosely spun. So now I have Yak, Alpaca, Llama, and Possum. Anyone know where I can get some Camel? or some Buffalo? Maybe Sue was right. Maybe I do have a disorder.